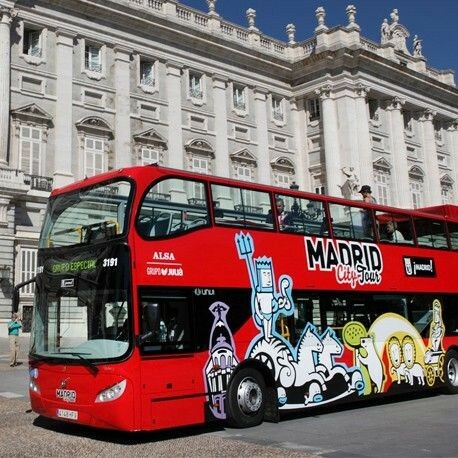 Madrid City Tour is the double-decker bus with panoramic roof that offers you the best sightseeing tour in Madrid. 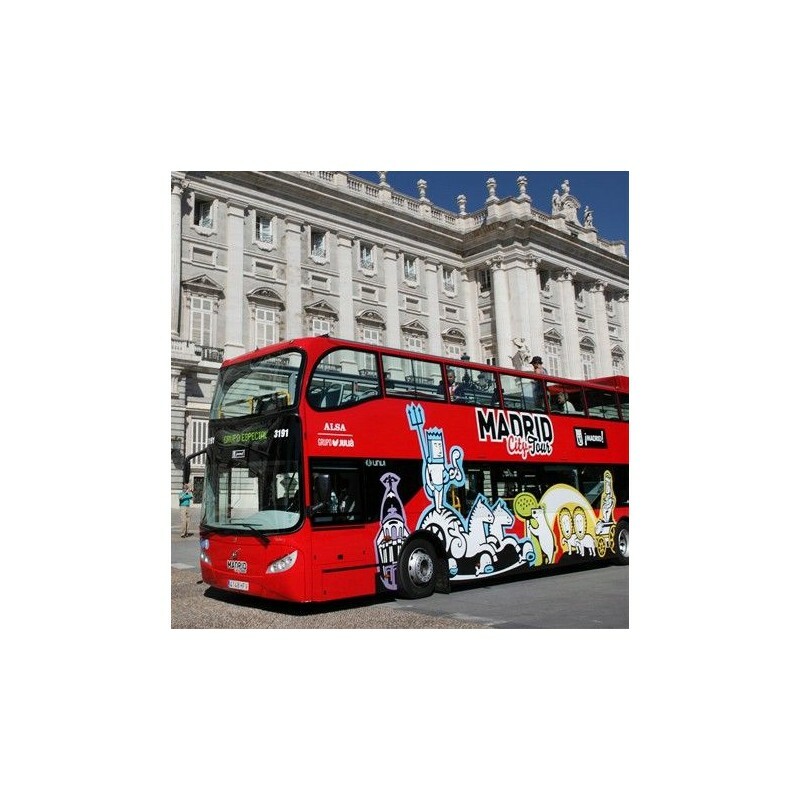 Your ticket gives you unlimited access to the two Madrid City Tour routes: historic Madrid and modern Madrid; get on and off the bus as many times as you want on all routes with a single ticket. Madrid City Tour is the most convenient way to get around the city's points of interest while enjoying the best views. On board the bus will have audio guides in fourteen languages ​​with which you will know in detail the history and anecdotes of the streets and monuments of the city. Relax, enjoy the road and take advantage of the free WiFi on board for our customers. Create your own tour of Madrid and get your tickets in a comfortable and completely safe way. Buy tickets for one or two days on our website. We will email you a voucher that can be redeemed when you board the bus. The ticket is valid until the end of the first or second day, depending on the modality. During the validity of the ticket you can get on and off the bus unlimitedly. The ticket is valid for all routes. Discover the most historical and emblematic city of Madrid with this circular tour that will take you to the heart of Madrid, to explore the magnificent tree-lined and artistic Paseo del Prado, and to admire the architectural jewels of the royalty of the Hapsburg. The history of Madrid and Spain has been written in the streets, neighborhoods and emblematic points of interest of the most classic area of ​​the city. From the Art Triangle to the Royal Palace and the Plaza de Cibeles to the Puerta de Toledo, we offer you a complete historical, artistic and monumental tour to visit the essential tourist spots of the city. Create your own itinerary in a tourist bus, travel at your own pace to the historical center of Madrid and visit the most characteristic monuments of the city. The Barrio de las Letras, Paseo del Prado, El Retiro Park, Gran Vía and Puerta del Sol are some of the points of interest that deserve a pleasant and quiet visit on foot. And at the end of your route, enjoy the Madrid night and its gastronomy at the Gran Via Casino and the flamenco art of Corral de la Morería. Artistic, historical, bucolic and gastronomic. Route 1: Historic Madrid of the Madrid City Tour offers you all the faces and facets of this majestic city. From March to October, 9h a 20h(*), Every day every 8 minutes (**). From November to February, 10h a 18h(*),Every day every 8 minutes (**). With the extended Route 1 you will explore all the tourist points of the Route 1 Historical Madrid as well as those monuments further away from the center and that are well worth visiting during your tourism stay in Madrid. This route will take you to the historical Puente de Segovia and Puente de Toledo, on the banks of the Manzanares River and to the unforgettable cable car to admire the best panoramic views of the city. From March to October , 10:05h and 18:05h. From November to February, 10:10h and 14:30h. Madrid is more than historical points of interest and royal monuments. On this route you will get to know the newest and most innovative Madrid, traveling from the south to the north, from the Stock Exchange building to the Nuevos Ministerios and from west to east, from Puerta de Alcalá to Puerta del Sol. Discover the most contemporary architectural works of the capital of Spain in a touristic itinerary that will bring you closer to the imposing KIO Towers, admire the works of Pablo Picasso and Salvador Dalí in the Reina Sofia or Thyssen-Bornemisza museums, to contemplate the modern sculptures of the Public Art Museum and look up to the towers of Colón. Route 2: Modern Madrid of the Madrid City Tour centers its route in this avant-garde area of ​​museums and headquarters of ministries. The Congress of Deputies and the governmental buildings of Nuevos Ministerios have their weight in this itinerary. Also, the sport is well represented in this route that passes through the Santiago Bernabéu Stadium of Real Madrid. From March to October, 9h a 20h(*),every day, every 8 minutes (**). From November to February 10h a 18h(*), every day, every 8 minutes (**). Extended Route 2: Modern Madrid will take you to all the tourist spots on Route 2, as well as to other essential monuments: the Cuatro Torres area, the great Las Ventas Bullring, the modern WiZink Center, the palatial Casón of the Buen Retiro and the emblematic Estación de Atocha. From March to October, 12:15h and 16:05h. From November to February, 12:30h and 16:30h. In summer, the magnificence of Madrid shows its colors and most emblematic tourist spots when the sun goes down. This time of year makes your visit to this majestic city continue when the stars shine in the sky to admire the most characteristic and illuminated monuments of Madrid. The Night Tour of the Madrid City Tour will take you to the same points of interest as Route 1 Historical Madrid, but on a route without stops so that you can enjoy, from our tourist bus, the best views of the city. From the Art Triangle to the Royal Palace and the Plaza de Cibeles to the Puerta de Toledo, the Night Route offers a complete historical, artistic and monumental itinerary through the most emblematic areas of the city. Your visit to Madrid will not be complete without having contemplated at night the most recognized monuments of the city. The stars and the illumination will make you rediscover the tourist spots that you have visited during the day but from a new and magical optics. Admire the play of lights of the Plaza de Cibeles, the Puerta de Alcalá, Gran Vía and the Templo de Debod, among others. Exclusively from June 16 to September 15. Two night tours without stops. First departure at 10pm from the Prado Museum. Where I take the bus? In any of the stops of the route. For your convenience you can download the map. Can I take the bus again after I get off? Yes, access to the bus is unlimited during the validity of the ticket. Can I use the ticket on both routes? Yes, all routes are included in the ticket price. Where can I connect between routes? At stops 1,2,4,5 and 17 of Route 1 and stops 1,2,3,10,4,13 and 15 of Route 2. Do you have WiFi on board? Yes, WiFi is free for our customers. Are buses adapted for people with reduced mobility? Yes, they are equipped with an access ramp through the rear door and space reserved for wheelchairs inside. On board buses there's always a member of Madrid City Tour to which they can go if they have any questions or doubts. Do not hesitate to call us on +34 916 322 541. (*) The start time is the departure time in each of the headers for each route and the end time is the time that the services end at their terminals. (**) The frequencies of passage may vary depending on the traffic, the influx of the public and other factors. The frequency of passage of vehicles allow complete routes throughout the day up to 80 min. and 65 min. before the end of the service. The services of 16: 40h and 20: 40h (depending on the season) will allow the completion of route 1. Those of 16: 50h and 20: 50h (depending on season) route 2. (***) The duration of the tour is approximate and may vary depending on traffic, public attendance and other factors.